Discernment — How can I learn God’s Will for me? Always begin with data, with what we know for sure. Judge the unknown by the known, the uncertain by the certain. Adam and Eve neglected that principle in Eden and ignored God's clear command and warning for the devil's promised pig in a poke. Let your heart educate your mind. Let your love of God educate your reason in discerning his will. Jesus teaches this principle in John 7:17 to the Pharisees. (Would that certain Scripture scholars today would heed it!) They were asking how they could interpret his words, and he gave them the first principle of hermeneutics (the science of interpretation): "If your will were to do the will of my Father, you would understand my teaching." The saints understand the Bible better than the theologians, because they understand its primary author, God, by loving him with their whole heart and their whole mind. Have a soft heart but a hard head. We should be "wise as serpents and harmless as doves," sharp as a fox in thought but loyal as a dog in will and deed. Soft-heartedness does not excuse soft-headedness, and hard-headedness does not excuse hard-heartedness. In our hearts we should be "bleeding-heart liberals" and in our heads "stuck-in-the-mud conservatives." All God's signs should line up, by a kind of trigonometry. There are at least seven such signs: (1) Scripture, (2) church teaching, (3) human reason (which God created), (4) the appropriate situation, or circumstances (which he controls by his providence), (5) conscience, our innate sense of right and wrong, (6) our individual personal bent or desire or instincts, and (7) prayer. Test your choice by holding it up before God's face. If one of these seven voices says no, don't do it. If none say no, do it. Look for the fruits of the spirit, especially the first three: love, joy, and peace. If we are angry and anxious and worried, loveless and joyless and peaceless, we have no right to say we are sure of being securely in God's will. Discernment itself should not be a stiff, brittle, anxious thing, but—since it too is part of God's will for our lives—loving and joyful and peace-filled, more like a game than a war, more like writing love letters than taking final exams.
. ... To lose a sense of Sunday as the Lord's Day, a day to be sanctified, is symptomatic of the loss of an authentic sense of Christian freedom, the freedom of the children of God. Here some observations made by my venerable predecessor John Paul II in his Apostolic Letter Dies Domini continue to have great value. Speaking of the various dimensions of the Christian celebration of Sunday, he said that it is Dies Domini with regard to the work of creation, Dies Christi as the day of the new creation and the Risen Lord's gift of the Holy Spirit, Dies Ecclesiae as the day on which the Christian community gathers for the celebration, and Dies hominis as the day of joy, rest and fraternal charity. Finally, it is particularly urgent nowadays to remember that the day of the Lord is also a day of rest from work. It is greatly to be hoped that this fact will also be recognized by civil society, so that individuals can be permitted to refrain from work without being penalized. Christians, not without reference to the meaning of the Sabbath in the Jewish tradition, have seen in the Lord's Day a day of rest from their daily exertions. — Pope Benedict XVI, Apostolic Exhortation SACRAMENTUM CARITATIS, February 22, 2007. Legend has it that St. James the Apostle went to Spain shortly after the death of Jesus to spread the Good News. Before setting out on his mission, he had spoken to the Blessed Virgin, who promised that he would do good work in Spain. His first efforts were unsuccessful, and in a vision, Our Lady came to offer him encouragement. When she appeared to St. James, she was standing on a pillar of jasper; which became the precious relic for the country of Spain. This pillar eventually became the real treasure of the Basilica of Our Lady of the Pillar. The oldest basilica outside of Rome, it was built on a spot that was the center of Christian activity as early as the third century. It was after praying often at this shrine that Father Chaminade conceived the idea of founding a religious congregation, the Society of Mary, the Marianists. When in 1908 the Marianists built Chaminade College, the families in the neighborhood attended services in the chapel that was appropriately named after "Our Lady of the Pillar." In the early part of our journey to World Youth Day we ventured to Lourdes, France. One of the episodes from CATHOLICISM – “Our Tainted Nature’s Solitary Boast: Mary, the Mother of God.” Mary is one of those subjects in the Church that not only engages the theological intellect, but offers so much more on so many other levels. As mother – God’s mother – she gives this sense of completing the human family and its mysterious connection to the divine. And her place in salvation history offers a very profound and tangible dimension to our faith through miracles, apparitions and the beautiful stories that follow from them. During one of the catechesis for World Youth Day we had the opportunity to hear Fr. Robert Baron atthe Love and Life Center. Below is the latest exclusive preview from Fr. Barron’s CATHOLICISM project coming out this Fall (2011). This clip tells the story of one such Marian apparition that occurred in Lourdes, France in 1858. Enjoy! 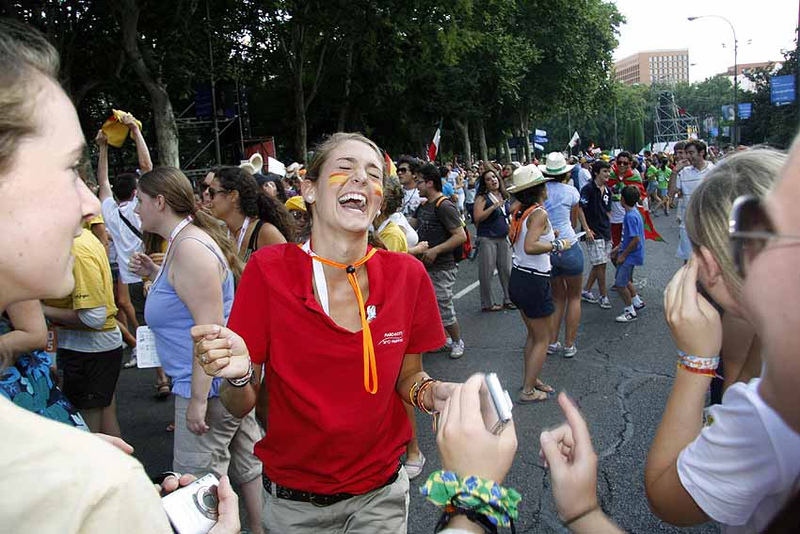 There are at least three innovations that characterize the World Youth Days with this pope: moments of silence, the very young age of the participants, the passion to witness to faith in the world. 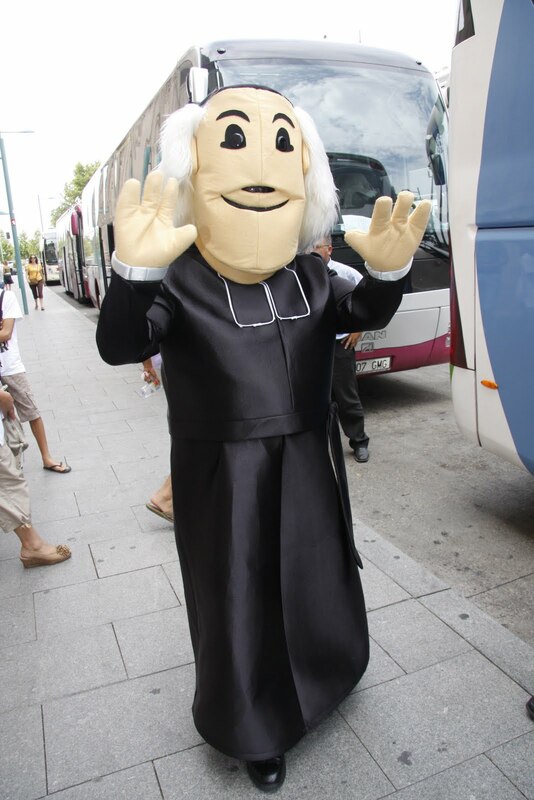 "Oggi vorrei riandare brevemente con il pensiero..."
From this and from his previous reflections, it is evident that Benedict XVI sees the World Youth Days as a salient moment of his mission as successor of Peter. To simple outside observation, these worldwide gatherings also demonstrate distinctive characteristics, which were especially visible in Madrid. The first is silence. A prolonged, very intense silence that breaks out at key moments, in a throng of young people that had been exploding with celebration just a moment before. The Via Crucis is one of these moments. Another, even more striking, is that of the adoration of the sacred host during the nighttime vigil. A third is that of communion during the concluding Mass. Silent adoration of the sacred host is an innovation introduced into the World Youth Days by Benedict XVI. The pope kneels down, and with him hundreds of thousands of young people kneel down on the bare ground. All of them kneeling not to the pope, but to that "our daily bread" who is Jesus. The violent stormy downpour in Madrid that preceded Eucharistic adoration made the silence even more striking. And the same thing happened the following morning, at the Mass. The unexpected cancellation of of the distribution of communion – for unexplained reasons of security – did not produce disorder and distraction in the endless expanse of young people, but on the contrary a silence of surprising composure and intensity, a mass "spiritual communion" with no known precedent. 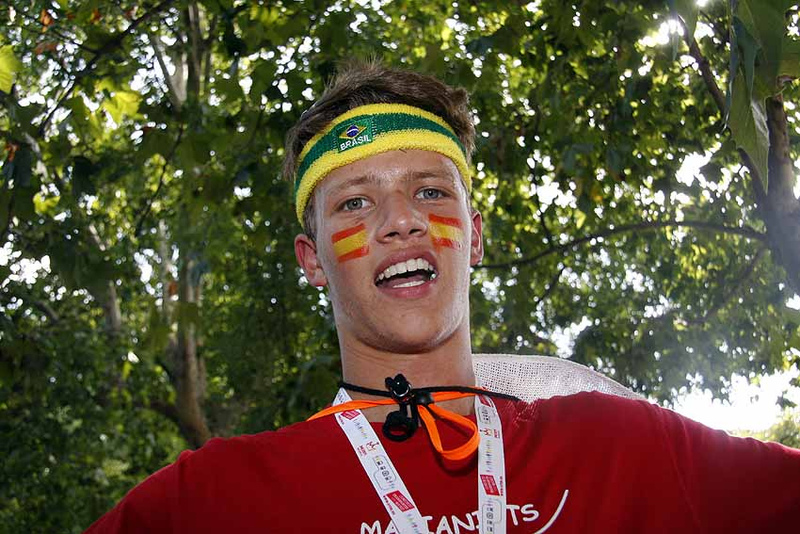 A second distinctive characteristic of this last World Youth Day is the very low average age of the participants, 22. This means that many of them were taking part in it for the first time. 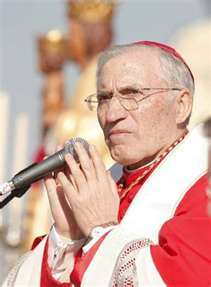 Their pope is Benedict XV, not John Paul II, whom they knew only as children. They are part of a generation of young and very young people highly exposed to a secularized culture. But at the same time, they are the signal that the questions about God and ultimate destinies are alive and present in this generation as well. And what motivates these young people is precisely these questions, to which a pope like Benedict XVI offers answers that are simple, yet powerfully demanding and attractive. 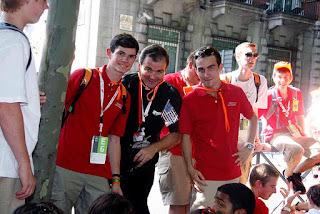 The veterans of the World Youth Days were there, in Madrid. But above all among the tens of thousands of volunteers who assisted with the organization. 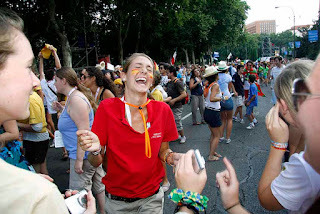 Or among the numerous priests and religious who accompanied the young people, whose vocations germinated during previous World Youth Days. It has been clearly shown that these gatherings are an incubator for the future leadership of Catholic communities around the world. A third distinctive characteristic is the projection of these young people "ad extra." They don't have any interest in the battles within the Church to bring it into step with the times. They are light years away from the "cahier de doléances" of some of their older brothers: for married priests, for women priests, for communion for the divorced and remarried, for the popular election of bishops, for democracy in the Church, etcetera etcetera. For them, all of this is irrelevant. It is enough for them to be Catholics as Pope Benedict shows and explains to them. Without diversions, without concessions. If we were saved at a high price – the blood of Christ – we must reach just as high in giving our lives as true Christians. "Dear friends, may no adversity paralyze you. Be afraid neither of the world, nor of the future, nor of your weakness. The Lord has allowed you to live in this moment of history so that, by your faith, his name will continue to resound throughout the world." The American vaticanista John L. Allen has called the young people who gathered in Madrid "Evangelical Catholics"
World Youth Day has come to a close and we have gone our separate ways. Repeatedly we have been asked, "What will you bring back with you?" "How have you changed from the World Youth Day experience?" "How will you explain what you have experienced?" And we have all changed. Some in large ways and some in small ways. Grace has been poured upon us in ways we may know. Grace has been showered on us in ways that will be revealed later. The city is different now. Madrid is calmer. The Holy Father has left. And we are different as well. We have taken so much with us from World Youth Day. We are now witnesses for the Gospel. We are now firmer in the faith. We are rooted in Christ Jesus! 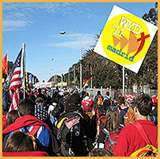 Our Brothers and pilgrims returned today ...but, lest anyone say they missed the past week's sights and sounds, more than ever before, a World Youth Day has been preserved for digital posterity. "Christ calls others to follow him more closely in the priesthood or in consecrated life. It is hard to put into words the happiness you feel when you know that Jesus seeks you, trusts in you, and with his unmistakable voice also says to you: “Follow me!” (cf. Mk 2:14). And so I now ask you to “abide” in the adoration of Christ, truly present in the Eucharist. I ask you to enter into conversation with him, to bring before him your questions and to listen to his voice. Dear friends, I pray for you with all my heart. And I ask you to pray for me. Tonight let us ask the Lord to grant that, attracted by the beauty of his love, we may always live faithfully as his disciples. Amen." Today, our pilgrims and roughly 1.5 million walk across Madrid, in the baking heat, to celebrate the Papal Mass at Cuatro Vientos airfield. The Mass will begin at 9.30 on Sunday morning and they will prepare with Vigil led by Pope Benedict this evening. The mood of this pilgrimage has not changed. Present last evening with the Stations of the Cross at the Plaza de Cibeles in the centre of Madrid were Catholic youth focused ultimately on the Cross. Anyone who waded through the crowds yesterday evening at Plaza de Cibeles, to witness the Way of the Cross, could not deny this. Pilgrims in Plaza de Neptune were dancing and singing until they quickly kneeled in solemn awe at the sacrifice they were commemorating. The young teenage girls giggling away in the local Spanish market, licking ice-creams were now taciturn statues, still in the peace of the life-giving love they were witnessing at each station. The suffering of Christ was portrayed in a profoundly unique way. The Way of the Cross incorporated the trials and experiences of a universal Church. Victims of drug addiction, earthquakes, persecution, war and marginalization were invited to unite their suffering with Christ’s by carrying the cross to the each station. It was a relay of suffering, in which the baton of burden was passed on in solidarity; victims united both in their suffering but also their hope at the prospect of salvation and joy at the end. Tonight’s vigil will be one of solemnity colored with hope, with the prospect of a glorious end to the Madrid portion of the pilgrimage. Off the the Knights of Columbus "Life and Love" center this morning to hear Archbishop Dolan and to celebrate Mass. Upon arrival the doors were locked and we were left standing on the street. After a few phones calls one of the Chaminade graduates was able to get us seats on the floor to hear Archbishop Dolan´s talk. Within an hour we were escorted to comfortable seats offered by Sisters of Life Mary Karen and Catherine. The graces were abundant today and they keep coming! Tonight we are out to pray the Stations of the Cross. We were able to view the Stations which were displayed today on our walk to the "Life and Love" center. May God continue his blessings! We spent the day visiting two sites as part of our WYD pilgrimage in Madrid. Our first venue was the Cathedral of Saint Mary of Toledo, also called Primate Cathedral of Toledo, Spain, seat of the Archdiocese of Toledo. Paloma, our tour guide, explained it is one of the three 13th century High Gothic cathedrals in Spain and is considered to be the magnum opus of the Gothic style in Spain. It was begun in 1226 during the reign of Ferdinand III and the last Gothic contributions were made in the 15th century when, in 1493. The vaults of the central nave were finished during the times of the Catholic Monarchs. It was modeled after Bourges Cathedral, although its five naves plan is the consequence of the constructors' intention to cover all of the sacred space of the former city mosque with the cathedral. It also combines some characteristics of the Mudéjar style, mainly in the cloister.The spectacular incorporation of light and the structural achievements of the vaults are some of its more remarkable aspects. 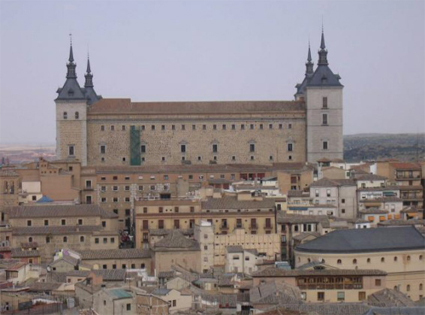 It is built with white stone close to Toledo. It is here that we celebrated Mass in a chapel for 130. We sat everywhere; pews, floor, santuary, choir loft, and the hallway to the choir loft. 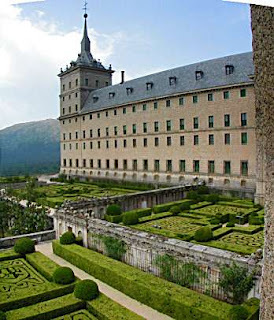 We then traveled to the Royal Site of "San Lorenzo de El Escorial", located 50 kilometers north-west of Madrid. It was born around the majestic Royal Monastery of San Lorenzo de El Escorial. Felipe II ordered its construction in 1561 to commemorate his victory in the battle of San Quintin. Paloma mentioned that it is now the town located in the skirt of the Abantos mount and has a pleasant climate during the months of summer. Tomorrow the Holy Father will celebrate Mass and talk with the seminarians. We snatched a peek at the area for the Pope, but for security reasons were moved on very quickly. No one was arrested for sneaking a peak. The Province of Meribah celebrates their 35th anniversary on this date. With joy we hav been graced with many blessings from Almighty God. May God continue to bless us with his grace. 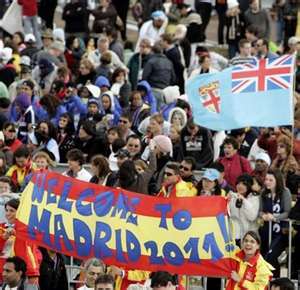 The city of Madrid has grown to epoch proportions and our pilgrims have managed to meet pilgrims from around the globe. The art of exchanging pins has assisted in meeting faithful Catholics from Long Island to Cimbayee. This afternoon we travelled to the LOVE AND LIFE venue sponsored by the Knights of Columbus and the Sisters of Life. Music and dancing filled the large arena about 45 minutes from our hotel. After an hour-long concert from LÁngelus we settled down to listen to Father Robert Baron about his work entitled, Catholicism. 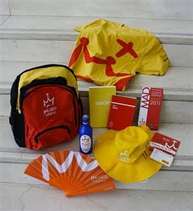 Late yesterday we received our pilgrims bags fro WYD - 2011. 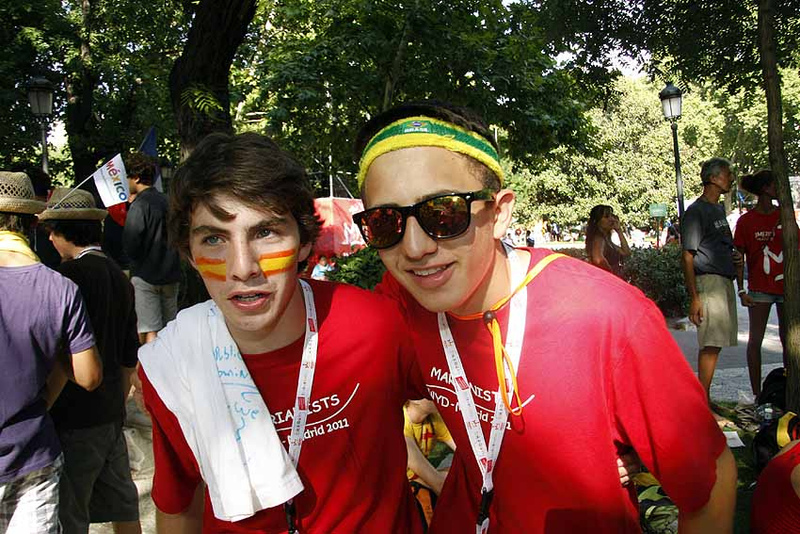 Once again, the spirit of WYD was phenomenal. We reconnected with many Marianist graduates participating and organiziang the event. The later part of the evening was spent at the WYD Opening Mass with the Archbishop of Madrid as the principal celebrant. The throngs of pilgrims descended just blocks from our hotel for this Mass. Tomorrow we travel to Toledo. Stay firm in the faith. After a long day of travels from Lourdes, we finally reached Saragossa. 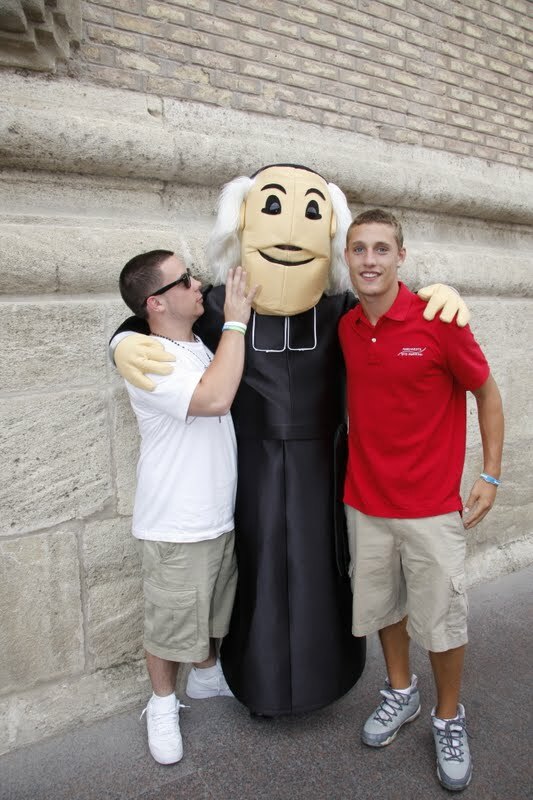 Upon our arrival, we were greeted by Blessed William Joseph Chaminade just outside the Basilica. After scrambling for a quick bite to eat, the pilgrims assembled for a tour of the basilica. 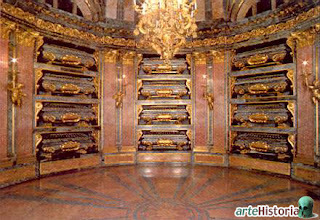 The Basilica Cathedral of the Pillar is the most important shrine in Spain. Its influence has global outreach. A church called the "Saint Mary House" already existed in Saragossa before the Muslim invasion in 711. In 1118, the Aragonese conquered the city and made it the capital of the Kingdom of Aragon. Only the tympanum still remains from the first Romanesque church built at that time. "Saint James the Greater heard the voices of angels who sang: ‘Hail Mary, full of grace ...' He knelt down at once, saw the Virgin Mother of Our Lord Jesus Christ between two choirs of a thousand angels standing on a marble pillar [...]. Then, the Blessed Virgin Mary called Blessed James the Apostle very softly to come to her, and said: ‘You should place the altar of the chapel near this [...] the power of the Most High will do miracles and wonders to those who call to me in need. This pillar will remain in place until the end of the world and there will always be someone in this town to venerate the name of Jesus Christ my Son.' "
In 1434, a devastating fire forced the Church authorities to destroy the church and to rebuild a Romanesque Gothic-Mudejar building, completed in 1515. The building consisted of a single nave, cloisters and a chapel housing the Pillar. When Spain was unified, the devotion of Our Lady del Pilar spread throughout Spain. Christopher Columbus discovered America on October 12, Feast of Our Lady of the Pillar! A simple coincidence? For us Our Lady of the Pilar is the place where Blessed Chaminade had a close experience with Our Lady and was inspired to found the Society of Mary. 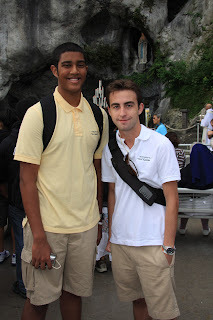 Our day at Lourdes was one filled with many graces. It was a day surprised by the joy of God. There were opportunities given and received. Generosity was shared and accepted. Faith expressed and grew. The miracles at Lourdes are alive and well. Mr. Joseph and Elyssa Metz assisted us at Lourdes with tours and instructions. Long time members of the Marianist Family, the Metz's shared their knowledge gained from over 20 years of service to the Church and the Grotto. We are deeply moved by their love and devotion to the Church. We are grateful to the time they spent with us. Our most faith-inspiring moment today was the Lourdes Baths. 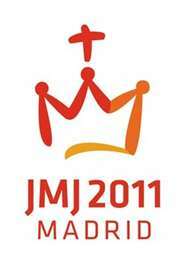 May God continue to bless our pilgrimage, "In His Footsteps, World Youth Day 2011." Danielle DiCicco and Jenn Procia share a little time prior to dinner at Hotel Eliseo. 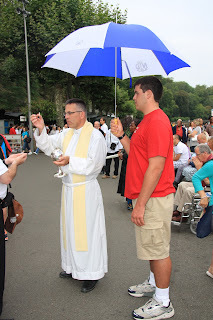 Kevin Liddy assists at the distribution of Holy Communion at the Grotto. Patrick Nuzzolese marks the communion spot for the hundreds attending morning Mass at the Grotto. 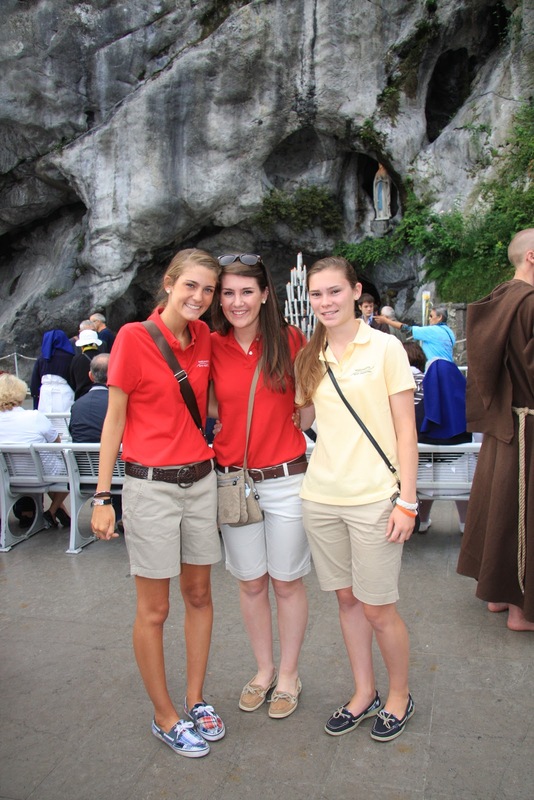 Eileen Scahill, Colleen Kammerer and Katie Alexanderson pause after Mass before the Grotto. Mr. Joseph Metz began the tours by the statue of Saint Bernadette. Lauren Doodian and Grace Simpson continue on our Metz Tour of the city. Kiran Swamy and Pat Morrissey stop before the Grotto. Our morning Grotto Mass begin with Fr. Thomas as one of the concelebrants. The enthusiasm of the Marianist pilgrims continued throughout the day. A check of the time among the joy of the crowd. Danielle Godley epresses her faith as she entered the convent Chapel. Mr. Joseph Metz kept our attention wit his vast knowledge. A short pause before the day's journey. 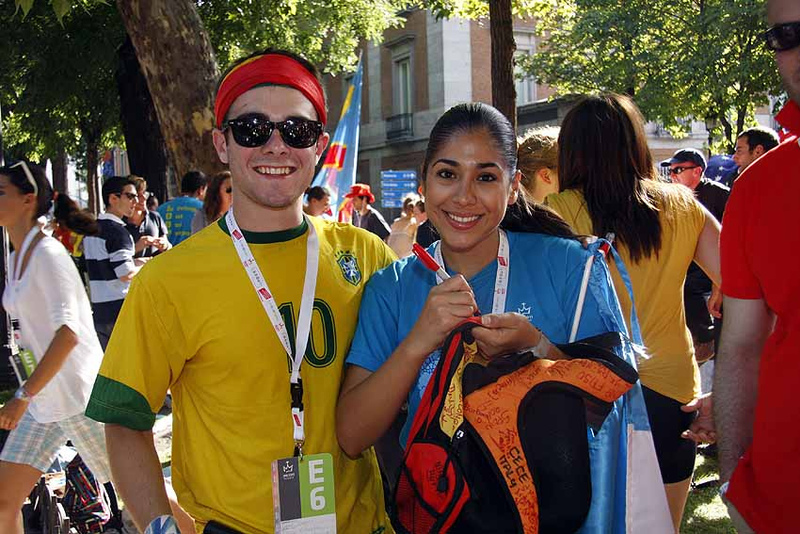 World Youth Day - Where's it at? World Youth Day - What's the Logo mean?